This liquid lipstick is medium purple shade which is matte in finish. 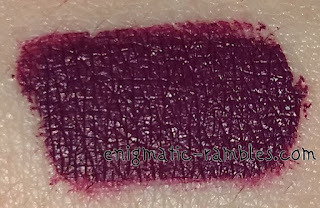 I found this swatched on my hand the same colour as it ended up on my lips, but slightly darker swatched as in the tube. This needed one coat plus going over in some areas to achieve full opacity. It didn't need setting and once dried it didn't stick to itself or anything once dried. It is kiss proof and lasts for hours, eventually it does begin to crumble from the inside out. It has a mild chemical scent in the tube, but on the lips the scent disappears. Clearly with such a bold colour you need a lip liner as with the doe foot applicator I couldn't get a precise enough line.